The award-winning "Junior" series introduces your child to positive role models and inspires your child to take advantage of life's opportunities. 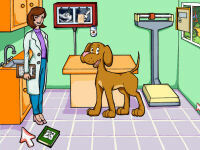 Put your child in a role of an animal doctor traveling through the animal hospital. Let one cure all the sick animals. Is your kid up to the challenge? Help cure your favorite dog or tiger or giraffe. The purpose of this series is to show your child good role-models they can aspire to be. They may not become a doctor, vet, scientist, or inventor - but they can be motivated to develop the skills needed for each of these professions.